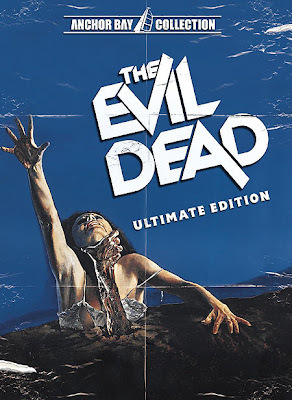 The Rockport Film Review: "The Evil Dead" Sam Raimi's Brilliant Debut Film! This was Sam Raimi’s first feature film and has since achieved epic cult status. There have been two sequels made, Evil Dead 2 & Army of Darkness. While Evil Dead 4 has been rumored for years, the release of “Drag Me to Hell”, Raimi’s triumphant return to the horror genre, prospects are looking good for another “Dead” sequel. Sam Raimi met his leading man and constant collaborator Bruce Campbell in high school and both also went to Michigan State University. In the late 1970s, Sam and Bruce put together a short film called “Within the Woods” which got them the funding they needed for a feature. Evil Dead was made in the early ’80s on a budget of $350,000 and is still one of the most loved cult horror films ever made. It seems to get even better with repeated viewings. It is the story of five friends spending a weekend in a cabin to relax and party. In the deep dark basement, they find a tape recorder, a book, and a ceremonial dagger. Upon playing the tape (which is a translation of the book) they inadvertently unleash an evil force that will eventually crash their weekend. The cabin was once owned by a professor of archaeology and the book is the Necronomicon or “Book of the Dead” it is bound in human flesh and written in blood. One by one the characters get inhabited by the evil force and turned in to hideous demons. As the tape says the only way to kill them is “total body dismemberment.” Raimi is a huge Three Stooges fan and this can be seen in many of his movies. Known for his slapstick style of comedic horror and gore, his movies are truly original. The acting is quite over the top, but that’s part of its charm. The makeup effects are pretty creative and effective for the budget that had to work with. The camera work and shot selection are innovative and well done. This is a film that stands the test of time and will be enjoyed for generations to come.